As part of the Victoria Scott street team, I'm thrilled to take part in the cover reveal for her phenomenal Fire & Flood series. 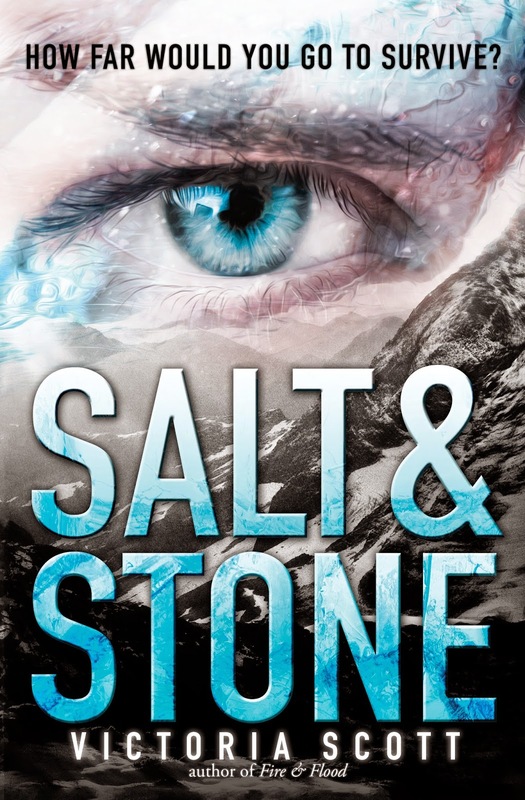 With the much awaited release of Salt & Stone, the series has undergone a cover transformation. The race is coming to an end, and Tella is running out of time, resources, and strength. At the start of the race there were one hundred twenty two Contenders. As Tella and her remaining friends start the final part of the race, just forty one are left, and only one can win. Until she receives mysterious instructions on how to become a Contender in the Brimstone Bleed. It's an epic race across jungle, desert, ocean, and mountain that could win her the prize she desperately desires, the Cure for her brother's illness. But all the Contenders are after the Cure for people they love, and there's no guarantee that Tella, or any of them, will survive the race. The jungle is terrifying, the clock is ticking, and Tella knows she can't trust the allies she makes. And one big question emerges... Why have so many fallen sick in the first place? I liked the previous cover on Fire & Flood, but absolutely love these too Kara. I think they suit the series perfectly. WHOA... are those the Australian covers are have the US ones been changed? Because if that's the case... I either a) envy Australians greatly, or b) I LOVE the cover change. They are the official world wide covers I believe. They may differ a little from these depending on the country, as the Australian cover on Fire & Flood originally had a slightly different font. I hadn't actually noticed that. Wonder if it's a proven sales method. Do covers featuring people, or parts of people sell more consistently than those who have inanimate objects? Wonder how we'd be able to find that out Soph. You and me both! I have a copy in the previous covers, but going to snap the new ones up soon. They're just gorgeous! Ooo I love these covers better than I think the US version? BUT yes they are beautiful! I still need to read Fire and Flood in the first place though. They're the new US versions, pretty sure worldwide as well. I absolutely adored Fire & Flood. If you're a big fan of dystopians like I am, you'll love it. Dystopian with a little magical science fiction twist. Just perfect! Damn, those are some fierce covers! I still need to read the first book. Fire & Flood has been one of my favourite reads this year, I absolutely loved it. If you've read her Dante Walker series, you'll enjoy this one. She weaves the same sass and snark in there. These are stunning covers aren't they. I'm a fan of having matching cover in a series too. There's nothing like buying a book and realising it doesn't match. Pretty sure that's a condition known as nerd rage. I'm still not a hundred percent sure what I feel about these covers. On one hand i'm ticked off that Salt & Stone won't go with my copy of Fire & Flood but these covers are pretty badass. Me too Lily. I love these new updated ones, but have to replace my original copy of Fire & Flood now too. When I buy the new edition, I can always give away the previous one. Any excuse to purchase books really. You know how much I adored Fire & Flood Kelly (or if you don't...just know that I enjoyed it quite a bit!) so I am SO excited to see this beautiful cover! <3 Thanks for sharing! I do know. I totally know. It's one of those books we both share in common actually. I loved it madly too. I have to grab a copy with the new covers though, or it'll upset me to look at my shelves. I'm vain and pedantic like that. You weren't? Bugger. I loved it, but dystopians are my preference and there haven't been many I haven't enjoyed on some level actually. I'm pretty easy to please. 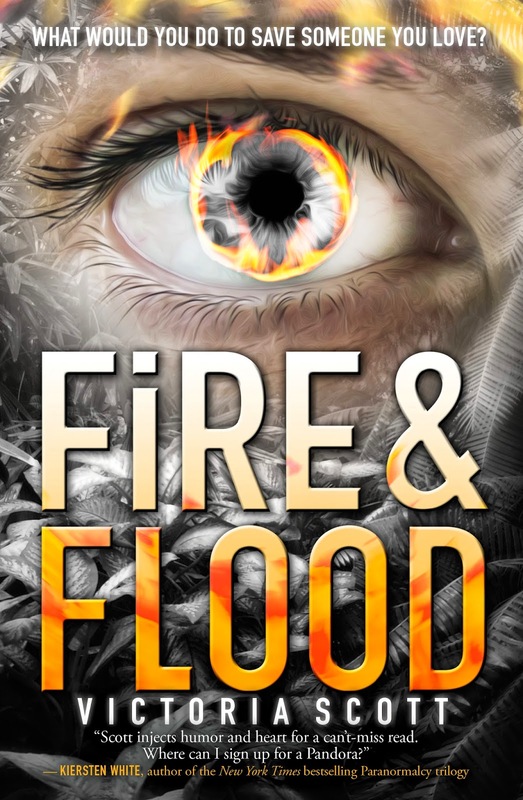 Before I'd seen the synopsis of Fire & Flood, just going by the cover I'd assumed it was an angel themed book, especially with the title sounded very God like. Thou shall not pass sort of thing. I love these ones. I can't wait to stroke them! I'm a big fan of Victoria Scott, both this series and Dante Walker. I love the sassy and snarky characters she creates, they really ARE the stars. Super entertaining! I can't wait for Salt & Stone to be released, Fire & Flood has been one of my favourite reads to date. Check your local library, they might be able to get one in. Me too! I was actually excited when I seen them via email, and may have even sent a reply to Victoria that was a tad too fangirly for someone my age. I really love the new look! I'm going to be reeeeally annoying (not that I ever am) and actually admit I don't like these as much as the first version. *cries in the corner of shame* I like them! They're fine! I just did like the really black and simplistic/minimalistic versions. BUT I STILL CAN'T WAIT FOR SALT AND STONE I MIGHT SCREAM JUST SO YOU KNOW. I like the old ones too, but these ones a little more. I think it suits the series, as the flaming feather for me indicates more of a supernatural Angel read. These are far more eye catching too. Hopefully they encourage more to pick up book one, I absolutely loved it! You're never annoying. Crazy, but never annoying. Eh, I'm not sure I like the cover redesign :( it's very IN YOUR FACE and kind of looks indie looking you know? I did like the previous version of Fire & Flood though because that was more simple. It is eye-catching though.